That’s right, Import Advantage has made it to the big screen that we so often support with our merchandise. 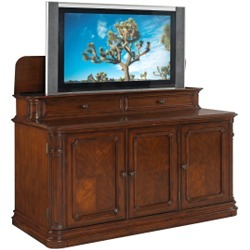 This particular cabinet is perfect for a TV that has both a large and flat screen. It allows you to display, or hide, your television, while giving you a lot of storage space for DVDs, stereo equipment, television receivers, and gaming systems. But the neat thing that most people don’t know about TV lift cabinets, is that there is a heavy duty lift mechanism that actually raises and lowers the TV into and out of the cabinet. If you want to watch TV, you can have it raise the TV out of the cabinet to be viewed. Having guests and would rather a beautifully finished cabinet? Have the TV lowered and your guests won’t even know that you have a television in the room. You can view our products on “The Price Is Right,” here.